The stunningly simple decor of Greek Xpress is accented with modern-orange chairs. Once a popular cuisine in Great Neck—with three thriving restaurants just a few years back—Greek food was difficult to find in the area last year. While neighboring towns prided themselves on their Greek, Turkish and Cypriot restaurants, the peninsula lacked an informal, non-upscale Greek place. 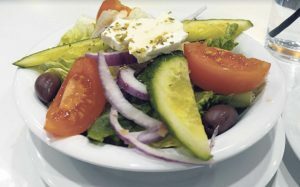 The recent opening of Mediterranean Seafood and Grill satisfied much of the community’s cravings for seafood and Greek meat dishes, yet people still wanted a place to grab a quick gyro for lunch with a café ambiance. 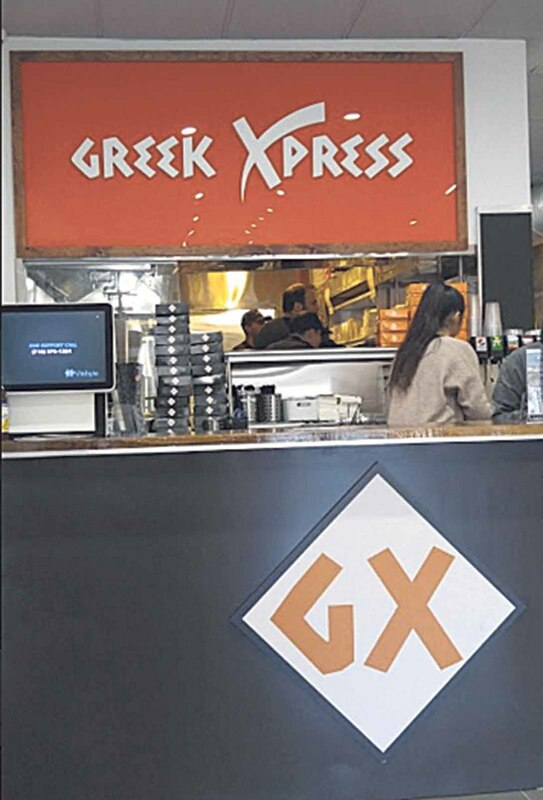 Greek Xpress, Great Neck’s newest eatery, serves that role. 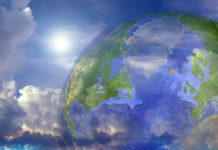 The eatery prides itself on its fresh, simple ingredients from both local farms and multiple regions in Greece. All produce is bought daily from Hunts Point Market and numerous Long Island farms, all meats are acquired from world-recognized brands that emphasize health benefits, and ingredients like feta cheese and olive oil are imported from Crete. According to the staff, 96 percent of the items served there are prepared in house following Greek recipes passed down from multiple generations. These fresh ingredients are featured throughout the concise menu. Appetizers—a mix of Greek and American options ($5.95 to $12.95)—consist of dips with hummus or spicy feta spread, soups such as chicken lemon or lentil, Greek classics like stuffed grape leaves or charbroiled octopus and American favorites including buffalo wings or zucchini fritters. Salads ($9.95 to $13.50) are filled with Greek ingredients like figs and feta cheese, and topped with homemade dressings, such as a balsamic vinaigrette prepared daily. Greek Xpress’s standout sandwiches ($7.95 to $9.50) are filled with a choice of falafel, chicken or pork souvlaki, gyro, Greek sausage or zucchini fritters, and each sandwich can be prepared as a platter for $8 more, with soup or salad and either fries, rice or lemon potatoes. A handful of dinner entrées ($17.95 to $25.95), such as oven-roasted chicken, moussaka or charbroiled salmon, are also available. Seated at one of the modern-orange chairs inside the bright-orange dining room, I started with the spicy feta spread, which had a nice peppery taste and a perfectly smooth texture. I tried a bit of the Greek salad, covered in homemade vinaigrette, a carefully assembled selection of finely cut greens and feta cheese in a tangy, slightly bitter, addictive dressing. 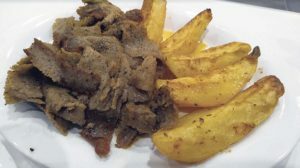 The gyro was fantastic: The meat was excellently seasoned with oregano and thyme, the vegetables added a needed crunch and the tzatziki sauce a slight dill taste. With a side of lemon potatoes, the restaurant’s rendition of a classic Greek dish takes the top spot in the area. With high-quality recipes, stunningly simple decor and above-average service, this eatery is off to a prominent start. 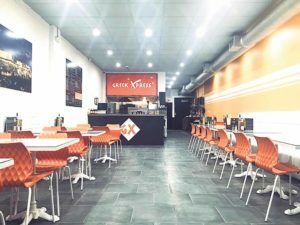 From preparing salad dressings from scratch hours before it opens to importing ingredients from Greece, Greek Xpress shows the care and finesse that restaurant goers desire most. If in the area, make sure to try the Park Slope and East Rockaway locations as well.